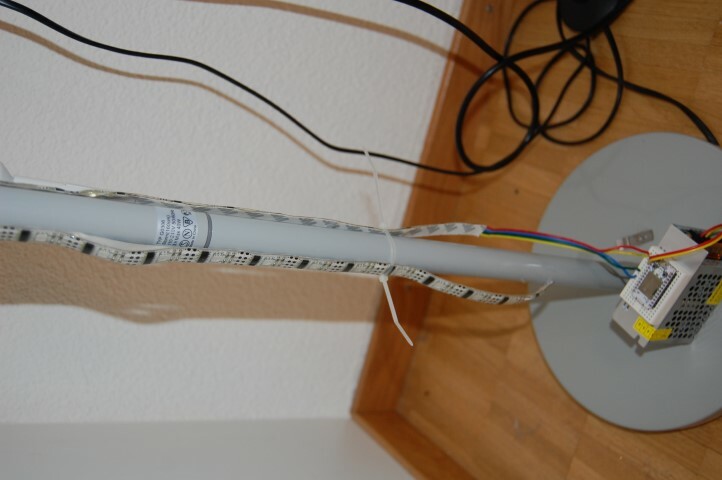 The spark then would query this service every five minutes and then light up a WS2801 light strip: half of it in the color of the temperature, the other half in the according color for the condition. 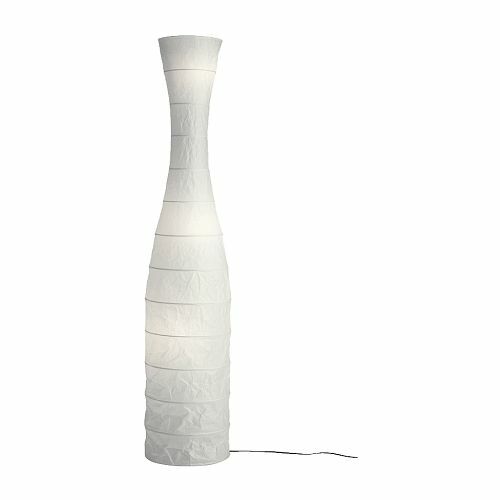 I thought it would be a good idea to incorporate the moodlight into my existing IKEA STORM floor lamp. 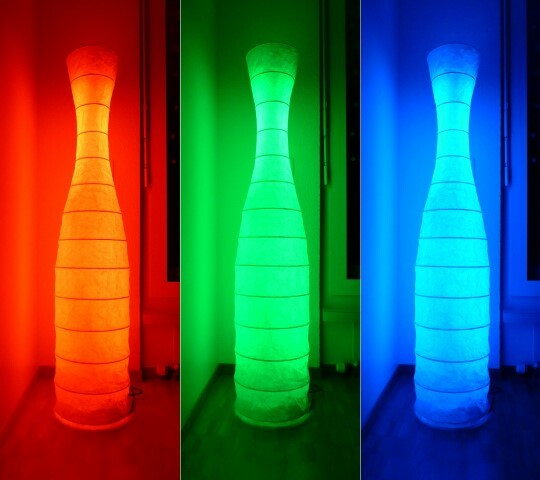 So at first sight it would just look like an ordinary lamp but would then blow you away with its insides! 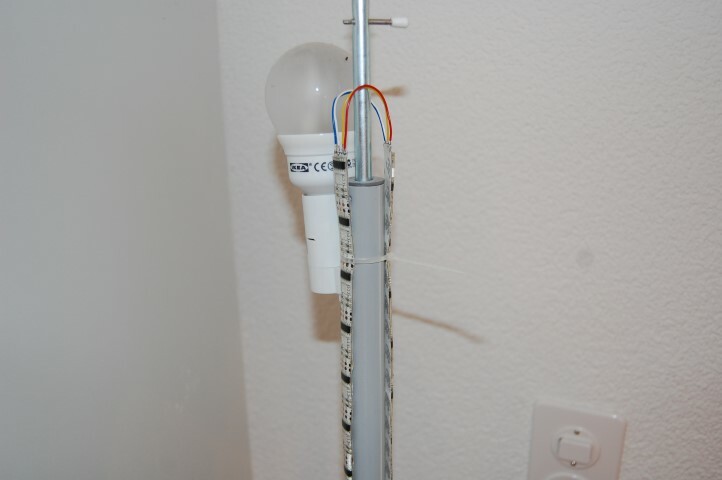 I added the Spark and a 5V/5A power source to the socket and attached the led strip to the pole. I also added some more funtionality to the spark, so I can control it via its cloud api. 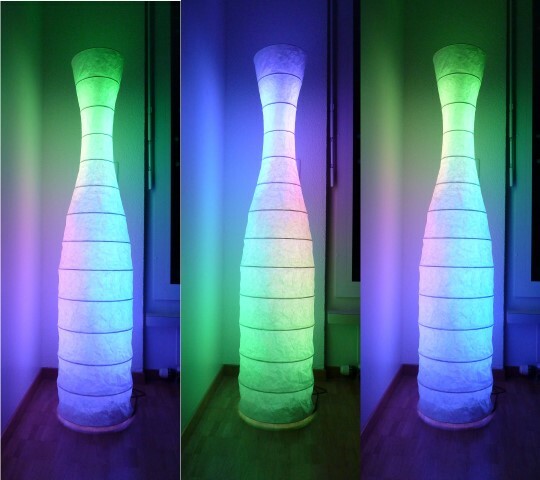 For example set a single color to the whole strip or even set the color for any of the 82 leds. I also added a rainbow mode. Check out the github repository for the code. Moodlight in weather mode. Green for No Clouds, Blue for Cold. 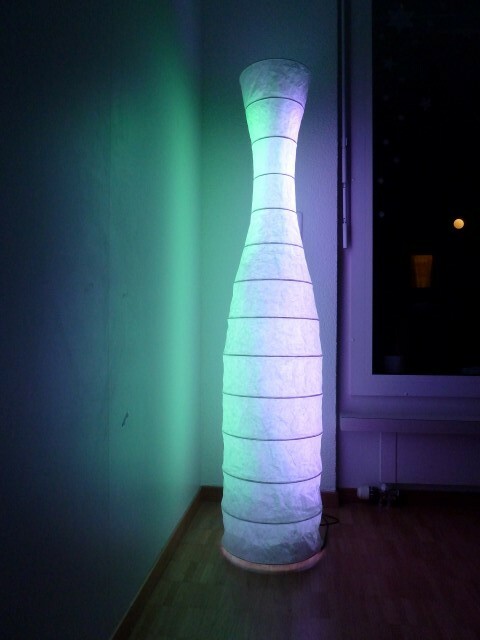 This entry was posted in Arduino and tagged Arduino, IKEA, Kickstarter, Mood Light, Spark by Roman. Bookmark the permalink. I am very interested in your lamp and looked at your github code, but can’t see how you control the colour manually. (I am a novice at such things). What I want to do is to control a lamp from a web-page, so I can use my smartphone, a laptop, a tablet, a desktop – even sending an email or a tweet (heaven help me!) to trigger the change, thus bypassing the need to install a specific app – if you’re web-connected, you can access a web-page, right? If you can give me a pointer, I would appreciate it. How would you like to connect to the lamp? To make it app independent I would rule bluetooth out of the equation. 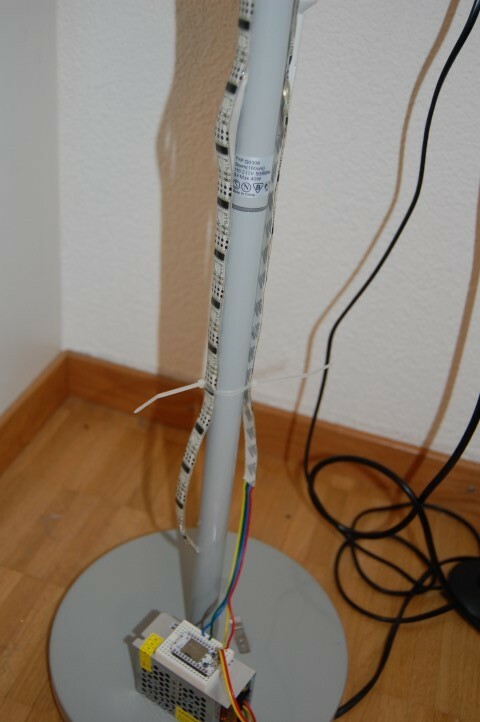 I guess the lamp should be web connected, an arduino with wifi or ethernet shield would do it. The spark – https://www.spark.io/ – is an excellent alternative. I used one for my project here. Hi James, sorry I have no idea how you would do that with a PLC. Hi, I’m curious about your lamp. Where did you get your LED lights from? Also you connected the LED to the arduino and programmed it from there? The LEDs are a strip of WS2801 that I ordered from AliExpress. And the advantage of using the Spark Core is that you can program it over the air and can poll weather information through wifi. 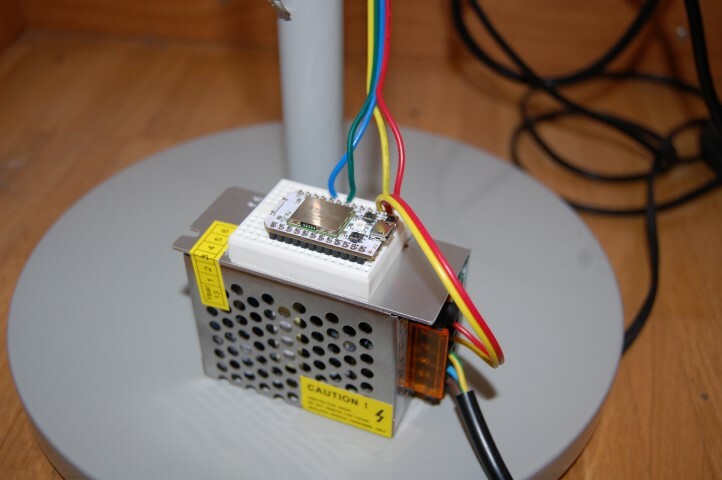 But you can use any Arduino compatible microprocessor for this project. I came across cause I am planning to do something similar for a Uni project but I am using a WS2812B, can you tell me if I am able to do this with this strip. Will the coding and wiring will change a lot? I don’t see a problem with the WS2812B. It’s a well known product and you will find lots of examples in the www. Just take it step by step and you will advance pretty fast. All the best for your project!